Ignaz Friedman - What is the Most Difficult Thing in Piano Playing? “What is the most difficult thing in pianoforte playing? What do you find the most difficult? That is very largely a matter of individuality, but I must say that, in teaching, the most difficult thing is to teach rhythm and color. Technic, that is, the mechanical side of technic, the rapid scales, arpeggios, octaves, etc., are mere trifles beside rhythm and color. Of the two, probably rhythm is more difficult to achieve than color. Indeed many, many pianists never develop their rhythmic side so that they are able to play more than a very few pieces with the proper effect. Rhythm is the life of music, color is its flesh and blood. Without either all interpretative art is dead. “In elementary training at the keyboard, the pupil is taught to keep time in a metronomic fashion; and almost everyone who plays the piano can keep time fairly well. But the rhythm is something quite apart. It is the design of the music, the proper employment of accents to delineate that design. Rhythm seems to hold the piece together, to make it live and have shape. Take two pianists and have each to play ten measures of any composition in which the rhythm is clearly defined and characteristic. One will give the notes between the bar-lines a kind of a swing and plastic character that will give a unity to the whole passage. The other will play the same notes in absolutely correct time; but there will seem to be nothing to hold it together. It has no entity, no unity, no artistic adhesion. “Only the most gifted ever play in good rhythm. I have often noticed that people born on the borderland of different countries seem to develop it wonderfully. By this I mean where one race mixes with another and the customs of one are welded with the customs of another. These people seem to develop elasticity of temperament and quickness of mind. Perhaps this is one of the reasons why the itinerant gypsies have such marked rhythmic gifts. If I were to advise the teacher of children, I should unquestionably say that there should, within the first two years, be plenty of examples and exercises in rhythm. This also applies to the violinist and the singer. As a rule they have less trouble with rhythm, as they have only one or at best two lines of melody to handle; whereas the pianist has three, four, and sometimes five different lines. “Color is the tone mixture accomplished by touch and pedal. It is the control of the overtones of the piano by every legitimate means. It is one of the things which makes the piano so wonderfully interesting. One can take a single passage and, by the different manipulation of the touch and the pedals, achieve a different effect every time. Every composer’s works afford a wonderful field for experimentation in tone color. Chopin and Schumann offer marvelous opportunities. If pianists only would listen more to their playing, better results would be achieved. The singer or the violinist thinks more of tone color, because he feels that he must make the tone. The piano is unfortunately an instrument in which the novice thinks he can find his tones ‘ready made,’ merely because he can strike the key. For this reason teachers and students give far more attention to the matter of mechanical exercises than they do to tone color and rhythm. Far better the simplest piece played with beautiful tone color and delightful rhythm than the most complicated work played without them. “What the ultimate results will be must depend upon the talent of the performer, the fineness with which he hears and enunciates his musical thoughts. “American students are technic mad and, despite their very obvious talent, they seem to think that hard labor at the keyboard will accomplish everything without the necessary thought, attention, patience, loving care which must be employed in developing tone color. The student who wants beautiful effects must imagine beautiful effects. He must hear with his mind’s ear and demand that his fingers produce what he hears. American students play a passage without ever trying to hear it in imagination first. In this way they lose much valuable time and a great deal of very important individuality. Let American students stop trying to hear with the eye instead of the ear. They make the very best possible kind of material for the teacher. They are immensely industrious, more than anxious to please. “With my own pupils I have always insisted that there was something that was in some ways more important than the teacher, and that is the habit of attending as many fine concerts of all kinds as posible. In fact I have insisted that certain advanced pupils go to concerts with me. There, sitting together, we could comment upon certain effects in rhythm and shading. The advanced pupil must begin to think of the pianists of the time as his contemporaries and he must learn everything possible from them. We build upon the past in art while we create for the future. Suppose the art student never had any models. Suppose he could not go to any art museums, or ever see any beautiful sculpture, engravings or etchings of the time. What kind of an art would he be likely to produce? Would it not resemble the Byzantine or pre-Raphaelite types? Tickets for the leading recitals and the leading concerts are just as much a means for a part of the education of the student as is the fee he pays to the teacher. This does not by any means indicate that the student should imitate blindly; but he should use the experience he gathers to make a kind of palette of colors of his own which he may learn to apply to his musical painting with corresponding skill. “Somehow the idea has got abroad that Leschetizky was a kind of technic specialist. Nothing could be farther from the real facts. 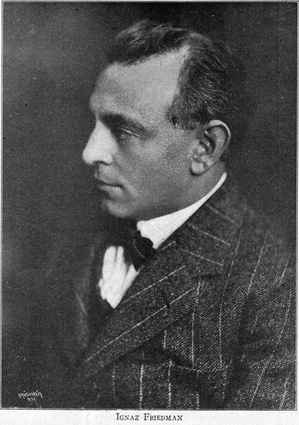 Leschetizky always gave far more attention to tone teaching than to technic. He used to shout to me, ‘Tone! Tone! Tone, always TONE!’ If anything, it was one of Leschetizky’s defects as his interest was only for pupils who were colorful. The result was that he developed the thing that he loved most about them, whereas such pupils needed technic most. It was a fable that Leschetizky was ‘technic mad’ and so many seemed to think. His preparatory teachers, such as Bree, Prenter and others, had a definite technical scheme; but that only went so far. It sufficed to make an ordinary technis (sic) into a fine modern technic, in the rudimentory sense; as far as great piano playing is concerned. It was only the beginning which every pianist should have. Then the greatness of Leschetizky came in. Of all teachers he knew how to make his pupils administer color and rhythm. At the same time he was most liberal and most anxious to have his pupils develop along their own lines. Once at one of my concerts in Vienna he watched my whole performance through opera glasses, noting every movement of my hands. At the end he came up with the greatest enthusiasm and gave me the greatest compliment he ever paid me. ‘ou (sic) are more sympathetic to me than any of my pupils because you have gone the farthest in advance of me.’ Often he would say, ‘How do you do that?’ when he heard an effect that pleased him. This is an indication of the simplicity of the man. How many masters would say that to a pupil ? “The technic required of pianists during the past century was very greatly in advance of that demanded in previous times. Before 1830, most of the compositions demanded a technic that laid almost entirely under the hand. Then came the myriad-colored Chopin and the orchestral Liszt, and piano playing leaped ahead enormously. Now we stand probably at the apex of possible complexities in piano playing. In the days of Mozart and Haydn, one played simply; now the pianist must play symphonically. Brahms, Reger, Rachmaninoff, Scriabin, Debussy, and Ravel have built new technical heights. Ravel is exceedingly hard to play, unless one has a thoroughly modern technic. It must also be remembered that where we met one pianist forty years ago with a good technic, we now meet thirty. Despite all that has been said, wiseacres, acquainted with the best playing of the past fifty years, have told me enough that I am safe in making the statement that there are probably at least ten pianists in this day with a technic equal to that of Liszt. “In this day the musician and the pianist is a very much better educated and a very much broader man than in former times. The conditions of the era demand it. Precisely as the great body of technically competent people have advanced, so do the people of our day demand their musical supermen. With the sound-reproducing instruments there will be no questions in the future as to how such and such a virtuoso played. These records will have great historic value, although they can never take the place of the regular musical training. They are, however, very valuable for the teacher and for the young virtuoso, as a part of the program I have previously outlined for the student, in which he shall hear as much good music as possible played by many different artists. The advantage of such machines is that one may not only hear an interpretation once but as many times as one chooses. “The player must realize that he must reach the emotional side of his audiences as well as the intellectual side. “Warmth, nobility, definite lines of interpretation, clearness, lucidity in execution, these then, should be the mottoes for every student and for every virtuoso as well. They should be rehearsed and recited every morning. Then, if one has talent he will progress by the surest and safest way. You are reading Ignaz Friedman - What is the Most Difficult Thing in Piano Playing? from the May, 1921 issue of The Etude Magazine. Dr. Richard Strauss - New Paths and Visions in Musical Progress is the next entry in The Etude.